In May 2014, Serbia was affected by heavy rainfall causing severe floods in many municipalities. Having in mind that municipality of Obrenovac was most affected by May 2014 floods, EU programme for flood relief focused mainly on this municipality allocating around EUR 4.500.000 for reconstruction and construction works on private houses and help to micro and small enterprises as well as agriculture households. The EU support in reconstruction of individual housing objects to Obrenovac is realised by Arbeiter Samriter Bund (ASB), Danish Refugee Council (DRC) and Hilfe zur Selbsthilfe (HELP) through delivery and installation of construction material which will help the beneficiary families to restore their homes from the damages of floods. On 18 January 2016, Danish Refugee Council commenced the rehabilitation works on 187 individual housing objects in Obrenovac and on 19th of February ASB started witht the reconstruction of 167 houses. The average grant amount will be 3,500 EUR per house and the works will be completed in 120 days in this first set of 354 households. Tomislav Petrović is the head of a 21-member household comprising his wife, their six sons and daughters and underage grandchildren. Tomislav is a pensioner with an modest income while just one of his sons is employed which is barely enough for such a large multi-generation family. Due to difficult financial circumstances, the family was unable to leave their home and find temporary accommodation so they are still living in the damaged household even in bad living conditions. These days the rehabilitation works have started in their house and the family observe the works with great anticipation. The EU support in reconstruction of individual housing objects to Obrenovac is facilitated by Danish Refugee Council and Vizija through delivery and installation of construction material. Although the family received the state assistance to renovate the house (3rd category of damage), it was in need for much larger rehabilitation which this vulnerable and very large family could not afford themselves. In order for Tomislav and his family to be able to move in and restore their living, the EU assistance will be used for the reparation of walls, flooring and carpentry. In the following few weeks, the family will be restoring their household fully. Slavica Ristic (1952) is the head of a 4-member household comprising her two children, son (1972), daughter Tanja (1976) and her grandson Nemanja (1996). Both Slavica and her son Ivan have serious health issues which makes running of their household economy more difficult. Slavica’s daughter Tanja is a single mother and she is also unemployed. Due to the floods that caused damages to their house, the family was forced to leave their home and find temporary accommodation paying the rent. However their funds soon depleted and they had to return to a half demolished premises. These days the rehabilitation works have started in their house and the family observe the works with great anticipation to move in soon. 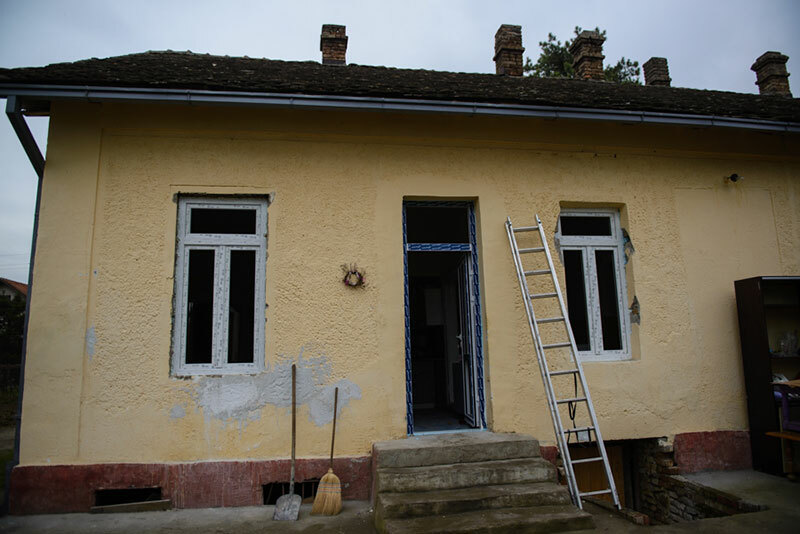 In order for Slavica and her family to be able to move in and restore their living, the EU assistance will be used to provide hygiene and sanitary conditions in the bathroom facility, for reparation of walls, flooring and carpentry. Hopefully, in not more than twenty days, the family will greet us in their fully restored home and the floods in May 2014 will be forgotten. At least 25 families will receive new prefabricated housing units for their completely destroyed houses, with provision of 14 basic household appliances and furniture sets. 500.000 Euros is allocated for new prefabricated houses in Obrenovac. 358 micro and small enterprises and agriculture households will be assisted through provision of grants. More than EUR 1.253.00 is allocated for restart of business activities in Obrenovac. ASB, DRC and HELP are implementing projects in 20 municipalities in Serbia in the total value of EUR 9.700.000 under the EU assistance for flood relief programme. The three non-governmental organizations are covering the following municipalities most affected by the May 2014 floods: Obrenovac, Kraljevo, Lazarevac, Svilajnac, Valjevo, Šid, Ljubovija, Mali Zvornik, Osecina, Bajina Basta, Loznica, Sabac, Paraćin, Jagodina, Smederevska Palanka, Ub, Negotin, Madjanbek, Kladovo. Re-start of business activities enabled for 524 affected small and micro enterprises and agriculture households most affected by the flood in the targeted municipalities, through the provision of grants. EU continues to help flood affected businesses in not only restoring their business activities, but also in improving and developing these activities. For this, under the ASB, DRC and HELP implemented projects, more than EUR 1.280.000 is allocated.